The salad you see on the left in the photo above is the radicchio, endive, orange, and walnut salad I shared yesterday. In that post, I mentioned I’d have at least one serving idea for you, and I do: this is how I packed up some of the leftovers in my take-to-work lunchbox on Monday. It’s a goal of mine to share more of my packable lunches this year and next, and that goal has only been strengthened by diving into nutrition work again. 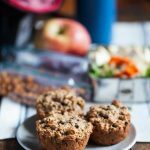 Many of my clients report that it’s easy enough for them to plan a healthy meal at home, but when they have to start planning meals to tote to work or school day in and day out, it becomes harder to meet nutrient needs while also pleasing the tastebuds. 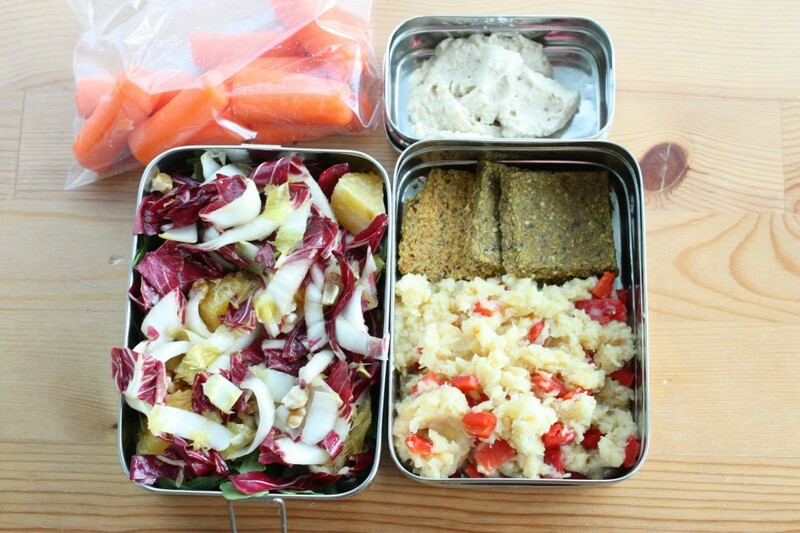 So, let’s chat about packing up a healthy, convenient, and satisfying vegan lunch. To these priorities, I also added the need for filling and nutritious snacks, since on most days I’d leave for campus early and not return to my place until close to dinnertime. In the end, a lot of my favorite raw food lunch staples (for example, parsnip sushi, or collard wraps) didn’t hold up well to these requirements; they’d get watery or mushy as the day went on, and they often didn’t quite fill me up as much as I needed them to on the go. So I focused more on grains, legumes, leftovers that wouldn’t leak in my bag, and nutritious, substantial snacks. My workplace this year is equipped with a fridge, so I once again have the capacity to pack stuff and then store it in a cool place. But I’ve retained a lot of my student lunchbox habits simply to conserve space, and it’s working out well so far. Here’s what you see in the lunchbox above, starting on the right and moving clockwise: raw crackers, prepared over the weekend, with ginger and nori (my stab at a homemade version of Lydia’s luna nori crackers–not quite worthy of the blog yet, but improving), cooked red lentils mixed with roasted red peppers for some extra flavor (I find that red lentils get quite pale in color when they’re cooked, which is why they look almost white), leftover radicchio, endive, orange, and walnut salad served over arugula, and then carrots and hemp hummus on top for mid afternoon snacking. 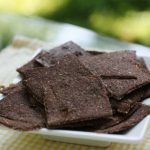 Filling, nutritious, easy to pack, and lots of variety in taste and texture. 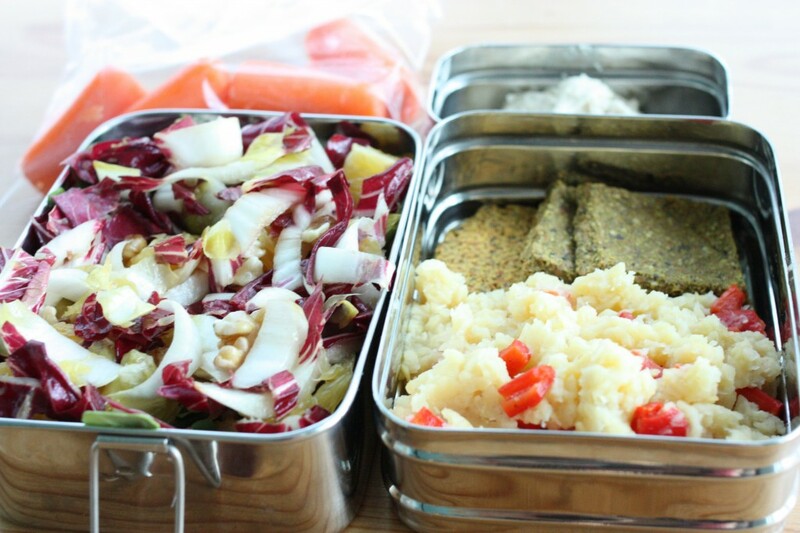 Batch cooking is crucial for lunchbox success! Over the weekend (or on any weeknight in which you expect a little free time) use your rice cooker, pressure cooker, or a large pot to make big batches of rice, quinoa, millet, farro, barley, and other grains, and/or lentils, black beans, chickpeas, black eyed peas, and other legumes of choice. I also make a creamy salad dressing or two (often tahini, sometimes nut butter based), and I bake some sweet potatoes. If you’re *really* short on time, don’t be ashamed to get canned, BPA-free beans and/or some of the ready-to-eat quinoa and organic brown rice that can be found in health food stores. It’s easy to microwave these at a moment’s notice. Speaking of the microwave, if you’re craving sweet potato but haven’t found time to bake it, you can pierce it and microwave cook it for about 6-7 minutes; it’s certainly not as tasty, but it’ll do in a pinch. When you pack your meal, remember to get a good balance of macronutrients on your plate: some healthy fats (avocados, nuts/seeds, oils), some complex carbs (root vegetables and potatoes, grains, legumes), and some protein (legumes, hemp, soy foods, nutritional yeast). 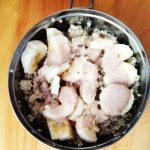 I’m not a believer in sitting around and calculating a magical ratio of these three groups via online programs and such, but it’s been my observation with clients (and in my own meal planning) that folks feel most satiated when all three macronutrients have been represented within each meal. Be sure to pack adequate portions of food. Most of my nutrition clients are actually more prone to skimping on portions than they are to overdoing it; the result is significant afternoon hunger, which leads to a lot of picking and snacking and erratic dinner patterns. Speaking of this, another common pattern I see in nutrition work is that folks tend to pack very volumnious, low calorie lunches (like salads that aren’t quite meal-sized). They’ll feel full right after, thanks to all the fiber, but hungry only a few hours later. The moral of the story? Don’t shy away from adequate amounts of calorie dense foods: you need the sustenance for a long day of work, learning, and living. As I mentioned above, I learned quickly as a lunch packer that I’d not be able to eat quite the same volume of leafy greens as I like when I’m working from home. One thing I like to do, though, is to chop greens into my grains, or mix them into leftover soups and stews that I pack. I love purchasing frozen, organic chopped spinach or kale, heating it, and then mixing it into a rice dish, for instance, or leftover tofu scramble that I’m packing, or a soup I’ve prepared and packed in a thermos. It’s a really easy solution if you’re struggling to get greens into a midday meal. In the photo below, I’ve mixed chopped spinach into brown rice, and dressed it all with lemon and olive oil and dill. As you can see, quite a bit of variety in spite of space constraints! Pros: Compact and neat looking. Perfect for stuffing into crowded backpacks or bags. In spite of not having the biggest dimensions, it can still fit a good amount of food. Cons: Not suitable for anything liquidy or prone to leaks, since the seal isn’t very strong. Not as much volume as other lunchbox options. Pros: Lots of volume, compared to other lunchbox options. Collapses after you eat, which means it’s super transportable as soon as you’ve had your lunch! Pretty leakproof, too. Cons: Takes up a lot of space, and can be awkward to pack when your bag is full. I also have a soup thermos for soups and stews. When I pack that, I’ll still pack some other stuff (a nice salad, some quinoa, roasted veggies, etc.). You can likely tell from the photos above what sort of stuff I tend to pack: salads, grain dishes, legumes, crackers, dressings, avocados, hummus, snack bars, fruit. Other packable ideas! A small baked sweet potato (these pack beautifully!) stuffed with some legumes and/or hempseeds and sides of choice. As for snacks? Apples or bananas with individual squeeze packets of nut butter, snack bars, trail mix, hummus+veggies, rice cakes with nut butter, raw snack balls, raw flax or juice pulp crackers, avocado slices with carrots. Sweet potato slices also make a good, grounding snack. Of course, the most important tip I can give you is to adapt your packed lunches to fit your lifestyle. Don’t get overly attached to rules or plans or guidelines you think you have to follow; the best lunch is really the lunch that will deliver healthy and tasty food in a way that’s realistic for you. If you’re wondering what I mean when I refer to the tendency to get attached to rules, it’s what I touched on earlier in this post. I used to insist–insist–on eating a big salad for lunch every day. This was partially a healthy expression of my genuine adoration of salads. But there was a touch of dogma, too; I’d heard certain health gurus say that one should eat a big salad for lunch each day, and I took that directive 100% literally. Eating a big salad, or a generous portion of leafy greens, is of course a worthy midday goal. The problem is that I’m all too prone (less so as I continue with my recovery) to turn perfectly reasonable, healthy guidelines into iron clad rules. It’s only in the last few years that I’ve started to know the difference between these two categories. Enjoying greens with most meals is a great suggestion/guideline. But it’s not a rule, and the world won’t end if not every single meal is heaping with greens. To illustrate this point, I recall a conversation I once had with an ex-boyfriend, who wanted to know why we had to eat a giant salad with dinner all the time. At first, I was defensive, and started to explain how healthy it is to eat greens with every meal, how rich salads are in micronutrients, etc. But the more I thought about it, the more I realized that he was right, at least insofar as he was trying to point out that I was a little too attached to certain habits. Being a student has been good for me, in that it has encouraged me to be more adaptable, to go with the flow, to prioritize my needs and to let go of routines that have hardened into rules. I hope to take a flexible attitude with me into the future, no matter what the future brings! Whether you’re a student, a professional, or simply on the go, I hope that this post is helpful. 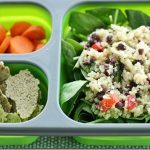 Questions about lunch packing? Comments? Fun plant based lunch ideas to share? I’d love to hear them! Happy hump day. Packed Lunch: Easy Quinoa Veggie Salad with Zucchini Almond Crackers. Plus VitaCost Sale Details! Molly, yes, the collard sushi is great on the go! I sometimes literally eat it as I’m walking out the door (though less often at this time of year). Glad you like the post. These are all wonderful and practical tips – perfect for a student like me! I, too, feel compelled to really pack in the greens at lunch, but I have found that wilted greens are just as good as raw. If I make any whole grains or beans, I mix in handfuls of baby spinach as soon as they are done cooking to allow them to become less voluminous. 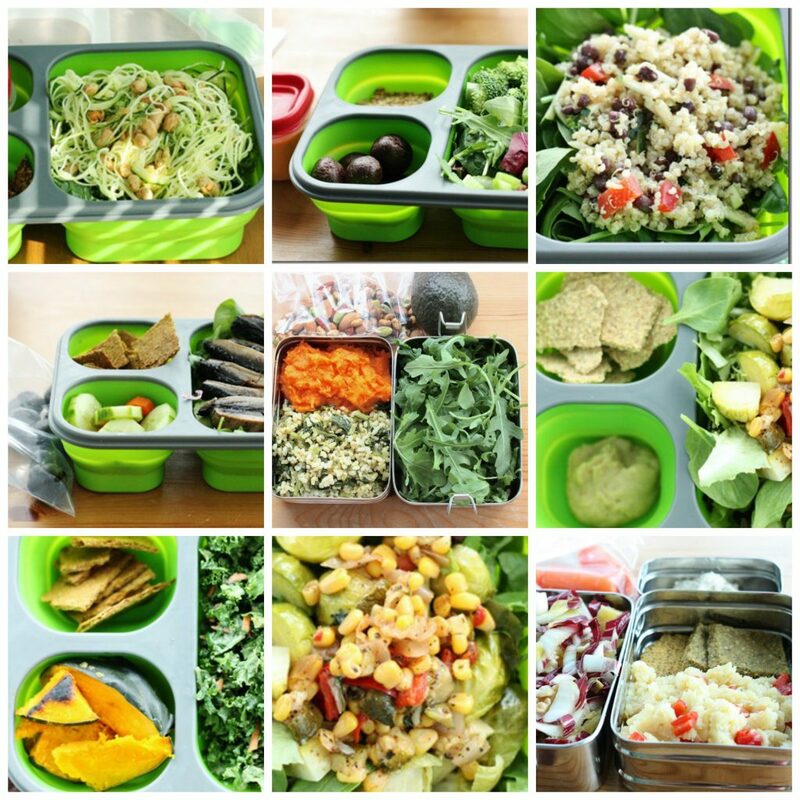 Also, my favorite containers are from Sistema; they are BPA-free, have secure snaps, come in a variety of bright colors, and are budget-friendly. I think that you would love them. Thanks for the tips and reminders, Gena! SO glad that the tips are helpful to you, Elisabeth. And now I need to go check out Sistema. Thanks for the recommendation! When you freeze your food do you use plastic dishes, plastic wrap or glass? I use all three — ziplock bags, sometimes BPA free plastic, and mason jars. Thank you so much! I love packable lunch inspiration! I too tend to turn guidelines into rules and have fallen into a trap of “needing” to have a big salad for lunch and not much else. I have been including more nutritious starches with lunch and sometimes that means I don’t have room for all that lettuce but I am feeling very energetic and even-keeled now. Love the ideas! Love that you’re feeling more balanced, Jill! Glad you like the post. Gena, this was SUCH a great post! Thank you for putting so much hard work into it. I found this extremely helpful, though I’m no longer a student in college, it took me back to days I had to eat all day on the go, and do it healthy of course, and basically lived out of my car. I had to pack a bag from 5 a.m. to last until 9 p.m. since I went to school before work and then back again at night, and it was tough! Luckily I found tricks to keep me full, and containers that fit perfectly on the go. I love that you mentioned the issue with the greens. I’m finally starting to realize I don’t have to have greens at EVERY meal of the day anymore, but I still can’t get past having them in at least 2 meals, in very large amounts. I think you’re right- it is somewhat because we tend to take healthy suggestions and good ideas, and put them into rule format. That’s a hard habit to get out of, but one I’m trying to still work on too. Thanks for your input on the containers ! I’ve thought about getting my mom one since she works two jobs and eats on the go. Since I work at home, I no longer need them, but I think she would love one! :) What do you think about the Bento Boxes since we’re on the subject? Heather, I’m glad the greens suggestion/comment strikes a chord 🙂 And I’m not surprised it does — I do think that healthy eaters can get a little obsessive about the greens. It’s not that the beauty of greens isn’t well established and true; it’s just that eating them doesn’t have to turn into yet another source of pressure, you know? I had just searched your blog for lunch today. Thank you for the wonderful words of wisdom. I pack a lunch everyday for work and I needed more ideas. Used your pesto sandwich today. DELISH. Thanks again for this wonderful blog. Lunch ideas are always welcome! 🙂 And thank YOU for reading! Great tips, thank you Gena. I too sometimes struggle with not taking enough food when I am packing my lunch. I find that moment of deciding do I add this, do I take more of this the hardest, because it feels like I’m committing to eating more. Once it’s in my bag, it becomes a lot easier and I can then decide how much I need to eat at the time according to my hunger. I find it important to remember that the amount I pack is just an option, and it’s okay to overestimate and leave some, which is better than underestimating and going hungry. Very good mental strategy, Emma. I’m glad it’s helped you. Thanks for providing lunch ideas. I bring my lunch to work each day and this is a great inspiration. One trick that I use is to keep healthy snacks in my desk like nuts and dried fruit that I replenish weekly. I also add some healthy treats like a lauabar for rough days when I need something to cheer me up a bit. I have not hit the snack machine in years. That’s a really good suggestion, Ruby, and I agree: having healthy snacks close to one’s workspace (even if you work from home) is super helpful. I think these guidelines are great for at home lunches too. I love the idea of preparing ahead of time, putting prepared foods in bigger containers in the fridge, and assembling a healthy lunch from them. Being prepared is half the battle. I love that there is variety and color in your lunches – it makes eating fun to look forward to. And thanks to you, I am no longer afraid of calories, as I find when I eat a “big salad”, void of good calories, I make unhealthy choices later in the afternoon. And happy New Year to you, too, Lisa! So glad that the post resonated with you. This post is exactly what I needed! My husband and I both work and most of the cooking/lunch packing is up to me. I often feel like I’m just making it through each day with food neither of us really loves. I’ve considered bulk cooking but haven’t been sure where to start. And I have a tendency to find rules and stick to them as well. Like a green juice or smoothie in the am, a salad for lunch, and anything else we didn’t get for dinner. It makes meal planning a lot easier, but it often makes things very unexciting. Thanks for sharing, a lot of tips and reminders I need to start using. You are so welcome, Emily. I think there’s so much value in mixing up routines; it encourages more variety and more creativity. It’s nice to stick to the tried-and-true when it makes life easier, but branching out is great, too. Great tips! I also struggle with keeping the lunch volume down (our work fridge gets pretty crowded). One thing that I have found really helps is actually to eat a good breakfast with a lot of protein–that sets me up well for the rest of the day and I just need less food for lunch and snacks. That’s a really great tip, Catherine, thanks — I agree that a really balanced breakfast is key if you’re to be on the go on all day! Wow Gena, I can tell you put a lot of work into this post and I really loved it. Right now I have the luxury of lunches at home (part-time student and part-time teacher) but I am trying to convince my boyfriend to bring his lunch everyday to be more budget and health-friendly (and I know when he buys lunch he likely eats more cheese- when I send him with lunch he eats all vegan!). 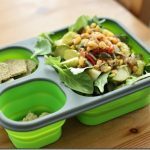 It works when I have time to cook dinners all week (like right now- my colleges are still on winter break) because I just make sure to send him with leftovers each day, but this is a great post for him to figure out how a little Sunday planning and prepping could help him pack healthy lunches all week long. I am going to send him this! Ha, Amy, I’ve been in that same position with boyfriends (encouraging more budget-friendly and healthy take-to-work meals). I hope that the post is useful to him! This post was great! As a student who is away from home from early morning until evening, I have really struggled to bring my own lunch. I really look forward to seeing more of your take-along meals as inspiration. Thanks, Erin. I look forward to sharing. Lovely! I usually just take leftovers from dinner for lunch, but that’s bc I’m eating in the office, and there’s a big fridge and a microwave. I’ll remember these tips for lunches on the go! Yah, these are really great. Thanks for sharing. I spent Dec. cooking for and caring for my sick sister. She had to go to treatment 5 days a week for about 5 hours a day, and I was in charge of packing her lunch. The key was variety and satiety. I felt bad because I was packing someone else’s lunch, but at first the portions weren’t heavy enough. Eventually I figured it out. I used the bento box lunch boxes they sell at Whole Foods. About the size of a book, they fit nicely into bags and I loved all the compartments I had to figure rout how to fill! If I get another job that requires me to be out of the house for long periods, then I’ll definitely get the bento box for myself. These are very helpful suggestions that you’ve provided! Much thanks! As a former packed lunch queen, I LOVE this. Awesome post! Wonderful tips, Gena, thanks! I usually pack leftovers because they’re easy, but not exciting. This post helps inspire me to plan further ahead and get creative. What a great post Gena. Though I don’t have to pack lunches at the moment as my classes allow me to be home for lunch most of the time, there are always occasions when I need to pack food for travelling etc. I’m so pleased you mention the greens issue. Food rules can be so pervasive and often do more harm than good. Balance is the way to go- no extremes! This is such a helpful, informative post! I always need creative ideas on what to eat for lunch- your mixture of spinach, brown rice, lemon, olive oil and dill is so appealing to me right now. Not sure why I never thought to put dill in a dressing, but thanks for the idea! I loooooove dill in dressings (and in general)! Girl. Re: formerly taking guidelines to incorporate raw greens into every single meal way too seriously — I am 100% with you! I’ve gotten a lot more loosey goosey (I’m my mother’s daughter. Laugh if you want.) about the “rules.” I really do feel more satisfied and alive with a serving of greens in me… most of the time. But sometimes, it’s exciting to order an entree that I couldn’t make at home. Wow, great post! I love those lunch boxes. Do you know where one could attain one? Just click the links I used when I named the two products in the post — it’ll take you to Amazon. This is fantastic Gena! For some reason I always struggle with healthy lunches or get bored of the few salads I have in rotation. I will definitely be referring to this post over and over! Good, good! I hope it helps. Sounds tasty, Kate. Thanks for sharing. Love all these tips! I’ve only recently realized that I do better with eating a healthy vegan diet during the day if I have a variety of snacks and small meals with me. I’m usually at work for 12 hours or more, so I’m literally eating almost all my meals outside of my house. This post has given me a lot of options to consider! So happy, Emilie! Glad you liked it. This is such a great post Gena! I’m pretty good with packing my lunch as I’m always on the go, but I love new ideas (collard wraps!). Your lunch containers are so cute! And I love Lydia’s crackers. Mmmm. I am fortunate enough to live close to their restaurant and it is amazing! Great post!! 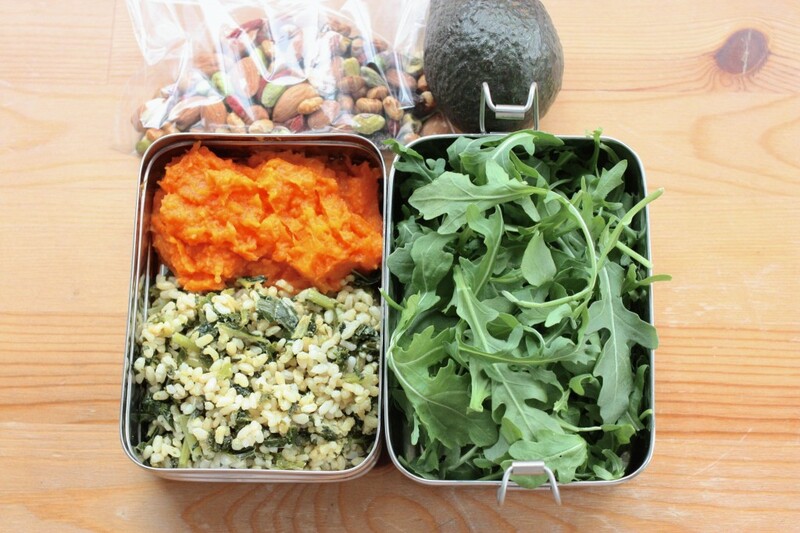 Packing lunches often turns into a rut of the same things, seeing your ideas is a great inspiration. For a long time i was one of those big salads of nothing lunch eaters and about two hours later i would find myself having another coffee and looking for a sweet snack- once i started making proper meal sized salads with fats and proteins my energy in the afternoons went way up (no more coffee) and i would be full for a solid four hours or so! I had the same journey with salads! Glad you like the post. Love it! For me (because of late nights away from home), I have to add “don’t need to reheat” to my meal pre-requisites. It’s funny how I’m finding raw foods are much more convenient that I ever thought before! They really can be! Texture can be a little tricky, but I really think that they can be easy and time saving if you focus on simple stuff. I love this post! I definitely find it challenging to make my lunches both wholesome and compact. First time visitor to this site and I really love it. Can’t wait to try out some of the recipes here. Cheers! Welcome!! Thanks so much for visiting. As we introduced all of us, never to waste you time, we will proceed through our merchandise and accompanying solutions. The chief item of our site designer company is of course website design. This is so perfect! This I exactly what I was looking for! My Fall Semester of college starts in a couple of weeks, and this was exactly what I was looking for today as over the past few years at college, I’ve developed some pretty bad eating habits! Thanks!